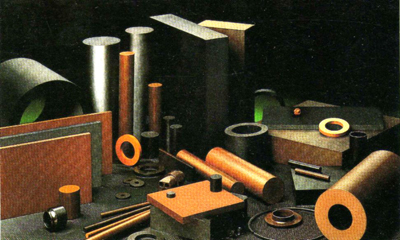 KIMIKA Industrial Corp. was founded on March of 1976, and for over 35 years, the company has maintained its credibility of supplying its customers with high quality materials for their various needs. KIMIKA has established itself as one of the leading supplier of engineering plastics, carrying an extensive range for almost all types of industrial applications: food & beverages manufacturing, material handling, conveyor systems, electronics assembly, chemical processing and many more. Nylons are used in a wide range of industrial components both for Original Equipment Manufacturing and maintenance. 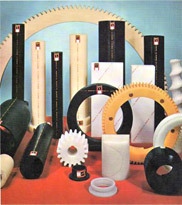 Sleeve and slide bearings, wear pads, support and guide wheels, conveyor rollers, tension rollers, pulley and pulley-linings, cams, buffer blocks, hammer heads, scrapers, gear wheels, sprockets, feed screws, star wheels, seal-rings, cutting and chopping boards, insulating components for electrical engineering. This is very well suited for machining on automatic lathes and is particularly recommended for mechanical precision parts. Gear wheels with small modulus, cams, heavily loaded bearings and rollers, bearings and gears with small clearances, valve seats, snapfit assemblies, all kinds of dimensionally stable precision parts for machine construction, electrically insulating components, parts which operate continuously in water of 60 - 80°C. This is made of crystalline polyester with properties characterized by high rigidity and strength. 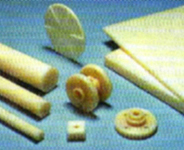 Abrasion resistance is higher than those of Nylon and Acetal. Heavily loaded bearing (brushings, thrust washers, guides, etc. 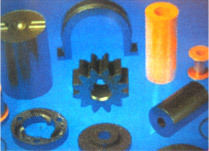 ), dimensionally stable parts for mechanism of precision (brushings, slideways, gears, rollers, pump components, etc.) and insulating components for electrical engineering. 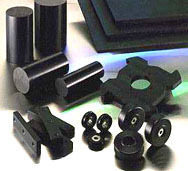 UHMW-PE sets the standard for engineered polymers with a unique combination of wear and corrosion resistance, low friction surface and impact strength. It is resistant to chemical attack and moisture absorption, and retains key physical properties to -30° C.
FOOD, BEVERAGE, BOTTLING and PACKAGING INDUSTRY. 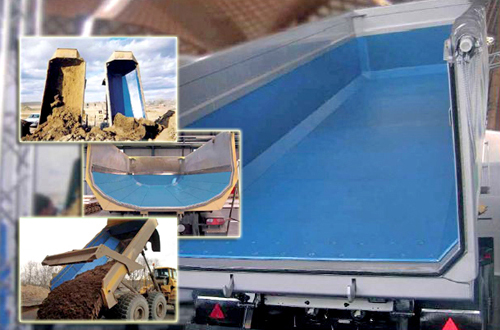 KIMIKA, now offers a range of OKUSLIDE ultra-high molecular weight polyethyene (UHMWPE) linings to help increase efficiencies in various transport and loading applications. Various industrial sectors ranging from mining, farming, maritime, coal and electrical to petrochemical, power and defence. Recommended for silos, railcars, receiving bunkers and hoppers in coal mining or farm segments. Best known for its outstanding chemical resistance, polypropylene is easily fabricated, welded and machined for many different applications, particularly in chemical engineering and tank building and medical and clean room technology. Rigid Polyvinylchloride is rated self-extinguishing, has an exceptional chemical resistance and is easy to machine. PVC shows high mechanical strengths, tensile strength and can be used in applications ranging in temperature from -15 °C to +60 °C. It can also be easily solvent cemented and welded. 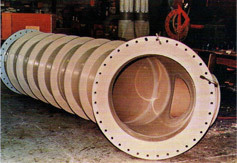 PVC is used in pipes for water systems and as sheets and bars for acid-resistant tanks, photo development trays, chemical apparatus, fuse boxes, and the like. It has a much higher temperature resistance than ordinary PVC and can be used in the temperature up to +105ºC. Acrylic or Plexiglas comes up for discussion as a technical construction material everywhere when a completely uninterrupted view is required. 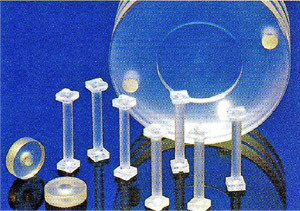 Optical purity, high strength and good chemical resistance make acrylic a widely used material for liquid meters and site glass. Polycarbonate is a transparent thermoplastic which offers very high impact strength and high modulus of elasticity. The material has a 145°C heat deflection temperature at 264 psi, absorbs very little moisture and resists acidic solutions. These properties, in addition to good electrical characteristics, make polycarbonate an excellent choice for electrical / electronic applications. 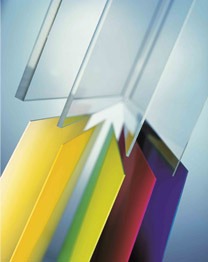 Its strength, impact resistance and transparency also make it an ideal material for transparent structural applications such as sight glasses and windows. This is an elastometric material of exceptional physical properties, toughness, and flexibility, resistant to abrasion, puncture resistance, and broad range of hardness. Rolls: guide, drive, pinch, etc. Teflon (PTFE) is a high molecular weight polymer. This is one of the most versatile plastic materials known and useful for a large range of products, for applications excluded to other materials. 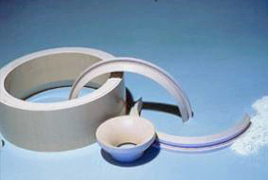 PTFE can be employed at any temperature from -150 ºC to +260 ºC. VALVE FITTINGS. Sealing rings and guides, dail seats. Packing / gaskets, plugs, bushes, impellers, washers, pistons, guide segments and sealing in general. MECHANICAL APPLICATIONS. Self-lubricating bearing, piston rings, hydraulic seals, "O" rings, anti-extrusion rings, sliding shoes, expansion bellows, pressure compensators, friction washers, flow regulators, sputter devices, sandwich seals, roller, balls, packs, collars. CHEMICAL APPLICATIONS. Conduits, siphon pipes, retainer rings, floe seals, closing taps, magnetic agitators, laboratory recipients, dilation compensators. ELECTRICAL APPLICATIONS. Connectors, coil separators, insulators, electronics in general, terminals, insulating layers, high voltage wiring, coaxial radar and TV cables. 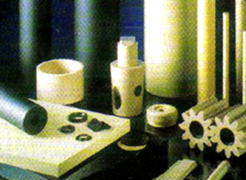 PTFE is a soft material that it can experience rate of wear when used in dynamic situation. Inert fillers could be added to increase resistance to wear, deformation and creep. It will improve stiffness, thermal conductivity, hardness and dimensional stability. However, the fillers decrease properties such as tensile strength, elongation, and dielectric values. Kimika's chopping boards are made from food grade high molecular weight polyethylene (HMW-PE). These chopping boards are extensively used for the processing and preparing of foods in such sectors as hotels, restaurants, butchers, abattoirs, poultry, cheese-vegetable processors and fish processing factories. Although most of the cutting boards are in neutral (white), special colors can be supplied to segregate meat, poultry, fish and vegetables. 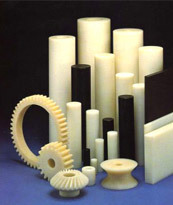 Most popular advanced plastics material due to unique combination of high mechanical properties, chemical and temperature resistance (continuously to 250°C). KETRON PEEK - 1000 natural (brownish grey) and black This general purpose grade is unreinforced and offers the highest elongation and toughness of all PEEK grades. The newly available black PEEK 1000 is ideal for instrument components where aesthetics are important, as well as for seal components where ductility and inertness are important. For high temperature applications, this advanced material offers an excellent combination of mechanical performance and dimensional stability. Torlon 4203 PAI offers the best toughness and impact strength of all Torlon PAI grades. It is very popular for precision parts because of its high temperature resistance, high dimensional stability and good machinability. Its good insulating ability provides numerous possibilities in the field of electrical components. The addition of PTFE and graphite provides higher wear resistance and lower coefficient of friction compared to the unfilled grade. 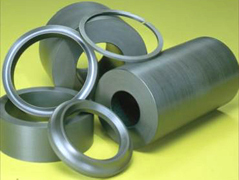 This grade excels in severe wear applications such as non-lubricated bearings, seals, bearing cages and reciprocating compressor parts. This 30% glass fiber reinforced grade offers higher stiffness, strength and creep resistance than Torlon 4203 PAI. 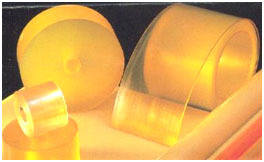 Ultem l000 polyetherimide (PEI) performs continuously to 170°C, making it ideal for high strength and high heat applications, and those requiring consistent dielectric properties over a wide frequency range. It is hydrolysis resistant, highly resistant to acidic solutions and capable of withstanding repeated autoclaving cycles. Vespel SP are made from DuPont SP-Polyimide offer a combination of properties that allows them to excel in applications requiring low wear and long life in severe environments. Allowable service temperature from 255°C up to 480°C for short periods. This is the unfilled base resin that provides maximum physical properties and the best electrical and thermal insulation. It is frequently used as valve seats, seals, and insulators working at elevated temperatures. This grade contains 15% graphite, added to provide long wear and low friction. These features make VESPEL SP-21 ideal for bearings, thrust washers and dynamic seals. Techtron HPV PPS is a reinforced, internally lubricated semi-crystalline polymer developed to close the gap both in performance and price between the standard thermoplastic materials. PSU 1000 Polysulfone (PSU) offers very good radiation stability, low ionic impurity levels and good chemical and hydrolysis resistance. Compared to PEI-1000, it has a lower property profile, often replacing polycarbonate whenever higher temperature resistance and improved chemical resistance. PVDF-1000 is a highly crystalline unreinforced fluopolymer combining good mechanical, thermal and electrical properties with excellent chemical resistance. It also shows good resistance to high –energy radiation. PVDF-1000 is a versatile engineering plastic material especially suitable for the manufacture of components for the petro-chemical, chemical, metallurgical, food, paper, textile, pharmaceutical and nuclear industries. FLUOROSINT has parallel chemical resistance compared to PTFE but higher load carrying capability, lower coefficient of thermal expansion and 1/9 of PTFE's deformation under load. Continuous use temperatures to 260°C. The Semitron ESd family of static dissipative products is designed for applications where electrical discharge in operation is a problem. They are commonly used for sensitive electronic components including: integrated circuits, hard disk and circuit boards. Semitron products are also an excellent choice for material handling applications, and components in high speed electronic printing and reproducing equipment. Semitron ESd 225 is ideal for fixturing used in the manufacturing of hard disk drives or for handling in process silicon water. It is tan in color. Surface resistivity: 1010 – 1012 Ω/sq. Semitron ESd 410c is ideal for handling integrated circuits through the test handler environment. It is black in color and opaque. Surface resistivity: 104 - 106 Ω/sq. Semitron ESd 420 is the only, truly dissipative plastic product for use in high temperature applications. Surface resistivity: 106 - 109 Ω/sq. Reinforced with a proprietary synthetic mica, Semitron ESd 500 offers an excellent combination of low frictional properties and dimensional stability. Semitron ESd 500 should be considered wherever Teflon PTFE is used. It is ideal for applications where controlled bleed off of static charges is critical. It is white in color. Surface resistivity: 1010 - 1012 Ω/sq. Semitron ESd 520HR has an industry first combination of electrostatic dissipation (ESd), high strength and heat resistance. This new ESd material is ideal for making nests, sockets and contactors for test equipment and other device handling components. The key features of 520HR are its unique ability to resist dielectric breakdown at high voltage (>100V). The graph below demonstrates the electrical performance of plastic materials commonly used in automated test handlers. Typical carbon fiber enchanced products become irreversibly more conductive when exposed to even moderate voltage. MC 501CD is a nylon-based compound containing additives which provides superior performance ESD applications. It has constant resistivity at all parts of its body. So, even after being machined, conductivity is unaltered. Even if the surface is worn, resistivity is unaffected. MC501CD never changes its resistivity, while conductive painting products become less efficient. Unlike surfactant-filled plastics, MC501CD never relies on moisture to be effective. This material is a revolutionary high-performance static discharge plate. It possesses general properties equivalent to those of common rigid PVC plates, ND7 is endowed with anti-static characteristics that remains effective over the very long term, even under tough conditions of use. Surface resistivity of 106 - 108 Ω/sq. 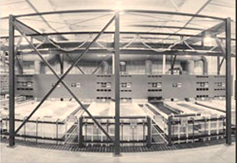 Long term endurance of initial characteristics such as "friction-resistance" and "high electric characteristics and transparency"
Hardly affected by humidity change. Stable surface resistivity against humidity change. Excellent chemical resistance and flame retardant. It can be used various types of equipment in semi-conductor industries. It also finds application in the electronis, electrical, edical, food processing, precision machinery and biotechnology fields, as well as in any other industry where the need to maintain a clean environment exist. Suitable for the structural components of vessel, clean rooms etc. By applying ND7 antistatic technology to polycarbonate and taking advantage of its base material's characteristics. PC-ND7 achieves excellent antistatic performance and outstanding impact resistance. Antistatic Property: surface resistivity of 106 - 108 Ω/sq. These materials have helped the PCB manufacturers to reduce solder defects, protect components against heat and electrostatic discharge, increase the productivity and stability of the manufacturing process, and reduce the size of carriers in conjunction with the miniaturizing trends for the PCBs. CDM ESD 68610 is a composite material made of glass mat, bonded with a high mechanical resistance resin system. Dissipator material with guaranteed values. Surface resistivity 105 to 108 Ω/sq.